I have had a love-hate relationship with Samyang / Rokinon lenses for a long time now. 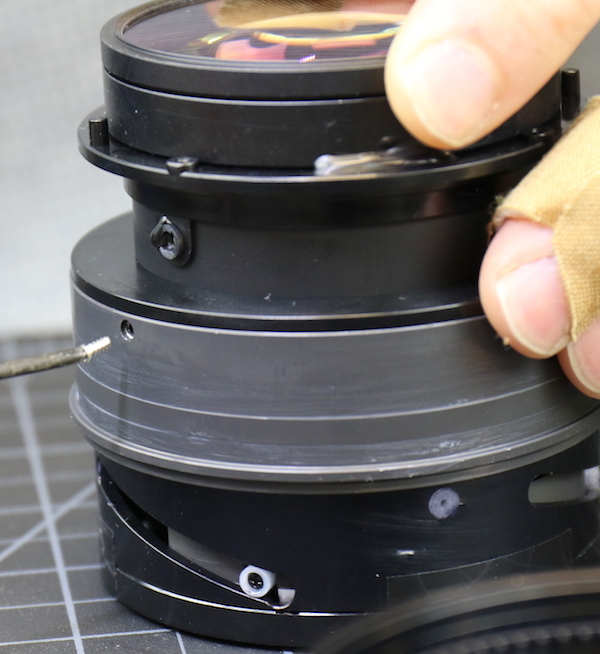 (We carry the Rokinon brand, because the distributor, Elite Brands offers repair services in the U. S.) Rokinon lenses provide good optics at an incredible price. They aren’t ‘built like a tank’ and aren’t going to take a lot of abuse. But the price of a new one is often less than the cost of repairing a brand-name lens. So I think they are an amazing value and own a couple myself. On the other hand, people’s expectations are often unreasonable. A lot of people think that a $500 Rokinon lens should be every bit as good as the $1,500 lens it can be used in place of. That’s not the case; some compromises have to be made. 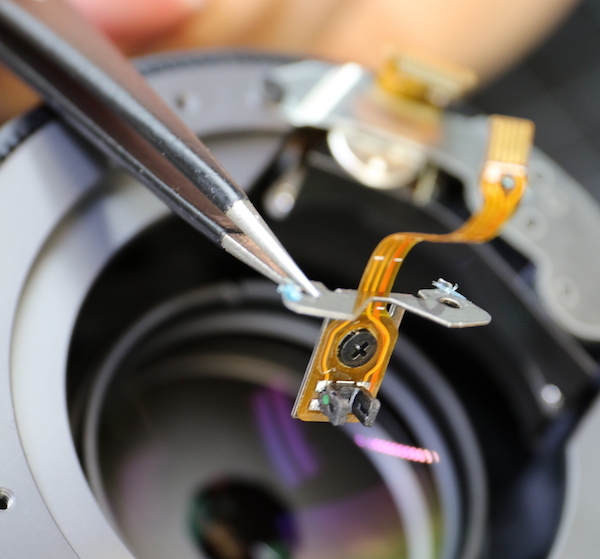 Quality assurance simply can’t be the same, nor can the components be engineered to the same standards as the $1,500 lens. So I love the value these lenses bring to the table, but it’s a bit more work trying to keep them in service. 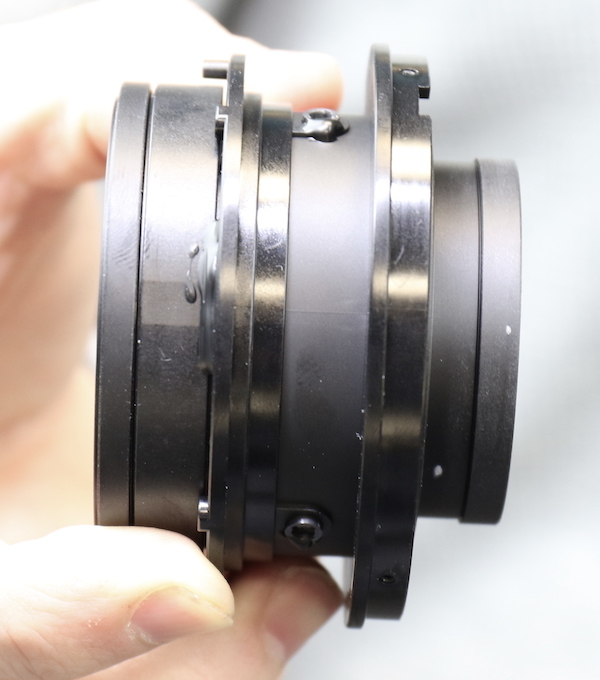 When we heard Samyang / Rokinon was releasing autofocus lenses for Sony FE mount, Aaron and I just looked at each other. 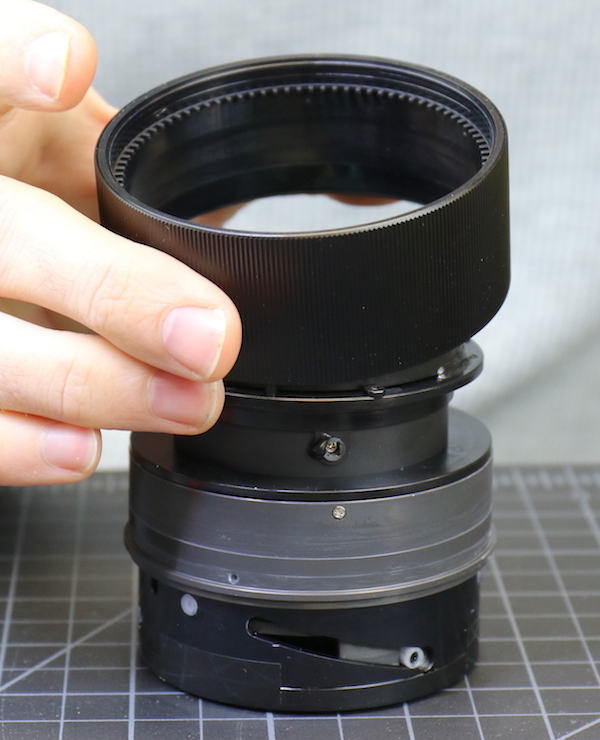 FE-mount lenses are pricey, and we loved the idea of having some affordable alternative lenses. 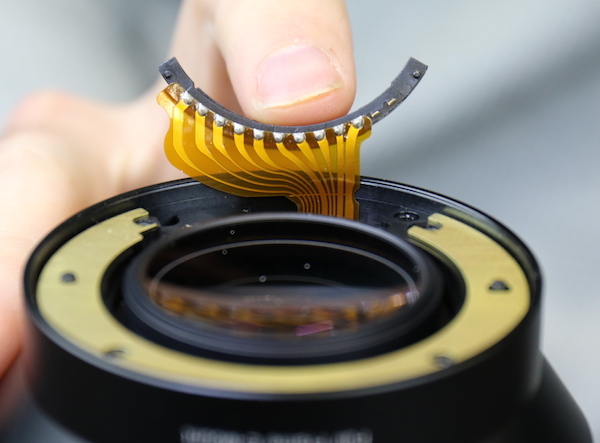 But autofocus was going to add a new level of complexity to the lenses, and we were a little concerned about how robust the construction would be. We were also interested in what kind of AF system they would have. Would it be a standard electric motor AF system, or did they use the electromagnetic system most Sony and Zeiss FE mount autofocus lenses use? So we decided to take a look inside and find out for sure. I won’t give away everything up front, but after the teardown, we were so interested we decided to run a batch through testing on our optical bench. Let’s Take Out Screws Now! 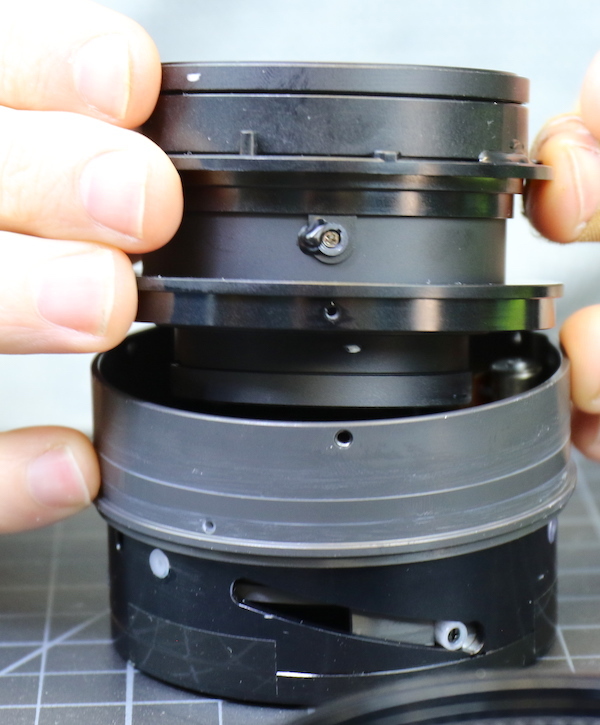 The rear light baffle and bayonet mount come off just like every other lens on the planet. The bayonet is rather thin aluminum, but it’s mounted to the lens with four large screws, which is a good sign. With the bayonet off, we can see the electrical connections in the back. 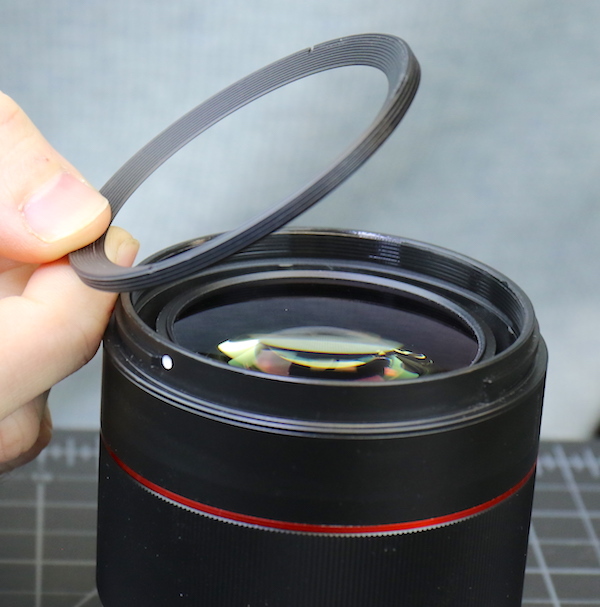 There’s also a ring shim, which is probably adjustable to get proper back focus distance. The rear barrel is held together with another set of reasonably robust screws. In other words, I don’t have any fear this lens is going to break off at the mount with minor impact; it looks pretty well made back here. With the screws out, the rear barrel slides right off. With it off and out of the way, we get a nice look at the inner rear barrel and focusing mechanism. Here, we got our first surprise of the disassembly. 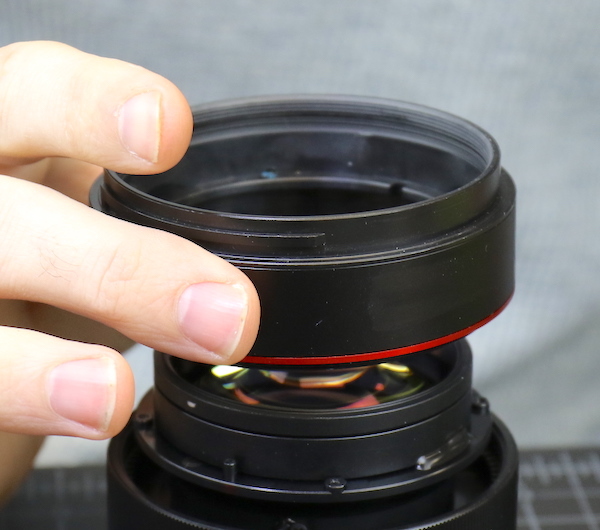 The rear group in the Rokinon 50mm f/1.4 AF has eccentric collars, meaning it can be optically adjusted. Not just can, but apparently was adjusted at the factory and then sealed in place with a big glob of black glue! This may not seem like a big deal to you, but it is to us. In many, if not most, inexpensive lenses the elements are just stacked together. Whatever you get optically is what you get. So this bodes well for lower copy-to-copy variation. 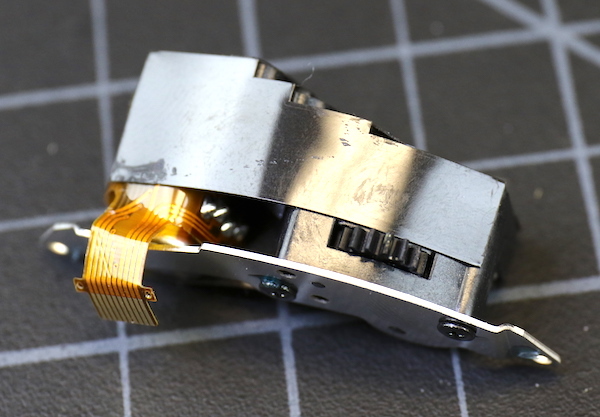 The next step in the disassembly was to remove the PCB board after disconnecting all of the flexes. 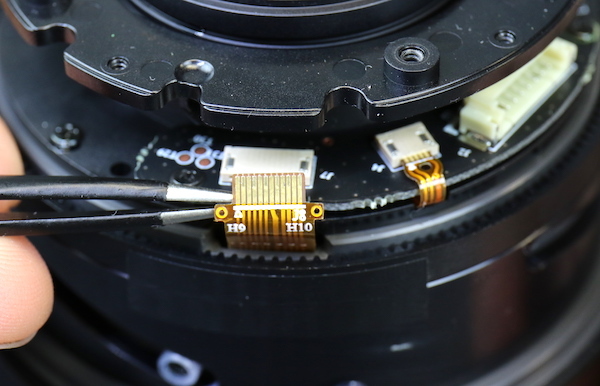 The flexes have a nice touch that absolutely no one will care about except those of us who work on the lens; there are some reinforced holes to help connect and disconnect the flexes without crushing or tearing them. The PCB itself looks just about like every other PCB. The rear group, which contains the adjustment element, was then removed from the center barrel by taking out a few screws. 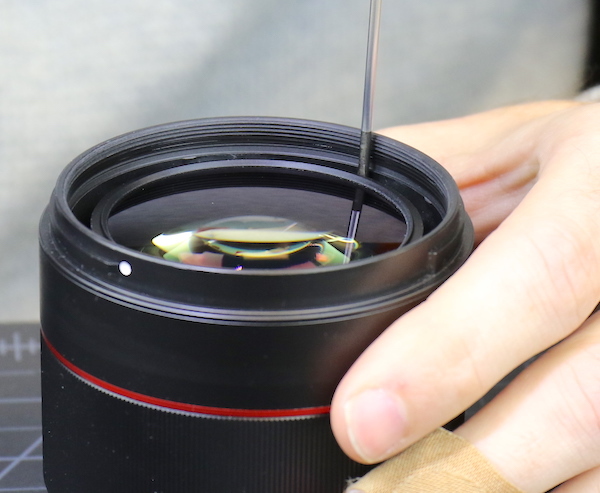 The center core of the lens, light gray in the image below, is metallic. The rear group assembly is plastic, of course, but a closer look shows there are thicker sleeves where the screws from the mount enter, giving some additional strength where it is needed. 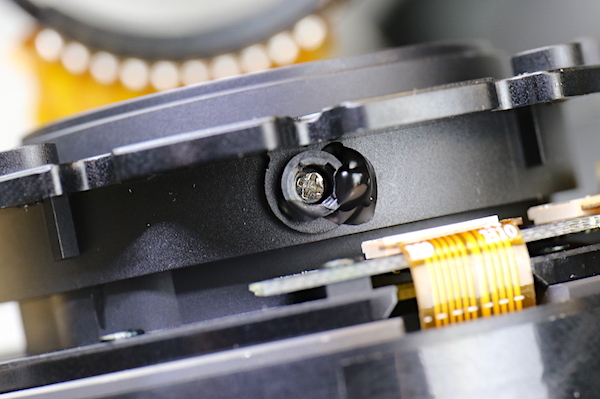 Looking down into the center of the lens, we see the autofocus micro motor with some black electrical shielding tape in front of it. The motor is very straightforward to remove since it’s all one self-contained unit. You can see the gear coming out the back of the motor and the gearing of the focusing ring on the barrel. And a closeup of the motor assembly itself. And one of the geared focusing ring. 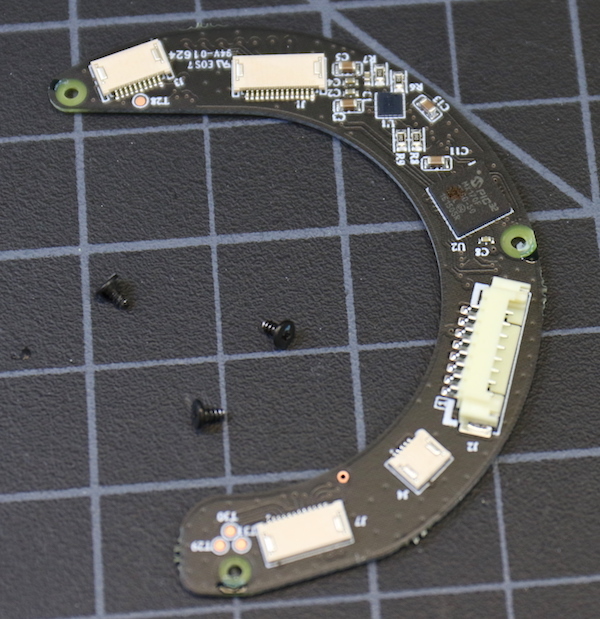 While we were here, we also removed the focus assembly position sensor. You can see the U-shaped sensor itself. 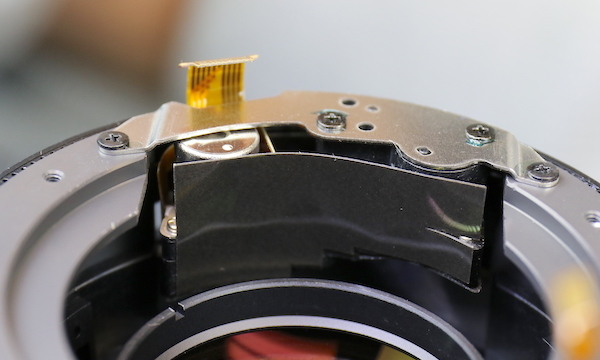 A vertical metal bar attached to the focus assembly slides up and down, giving feedback to the camera about the lens’ focusing position. At this point we’d done most of the obvious disassembly of the back of the lens, so we turned our attention to the front. 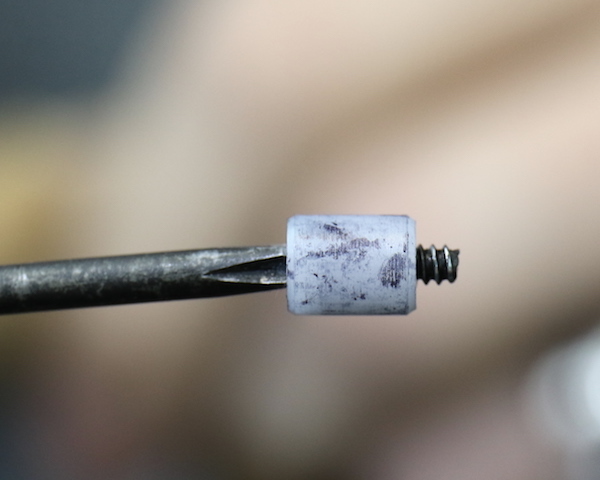 The makeup ring had prominent spanner wrench notches but was tightly glued down, so we applied a little alcohol. Even after that a fair amount of torque was required to get the ring off. The makeup ring is a thick, solid piece of metal. 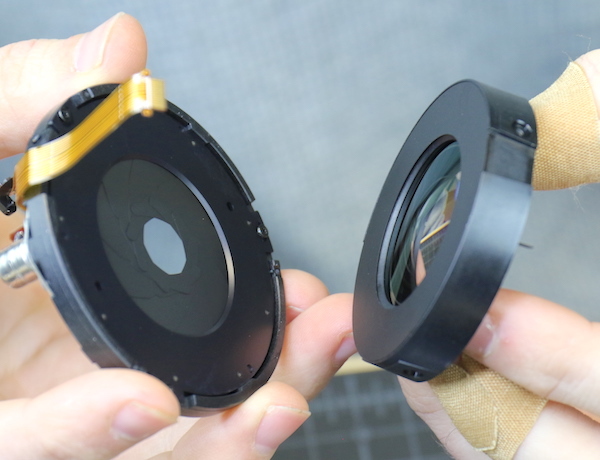 At first, you might wonder why they used metal for the makeup ring, but if you think about it, that ring braces the front of the lens, adding quite a bit of stiffness. With the makeup ring removed, the screws that hold the filter barrel in place are accessible. The filter barrel comes right off once they’re removed. 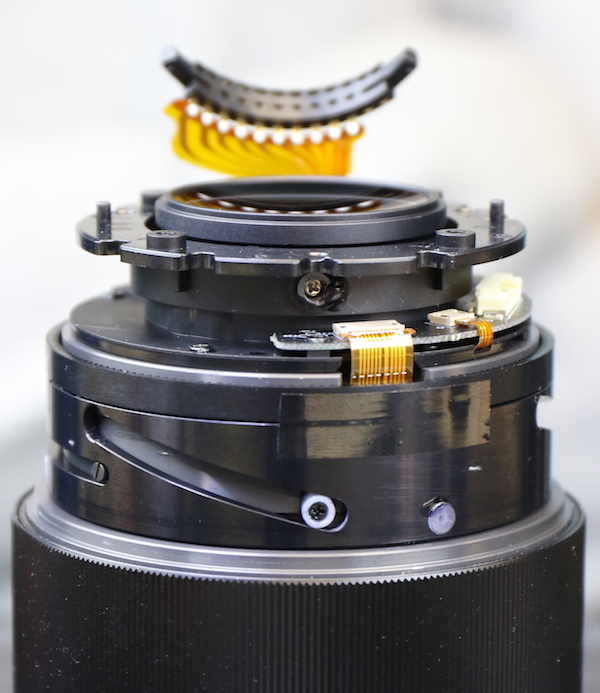 Now we can see the focusing ring rotation sensor, which has to be removed. 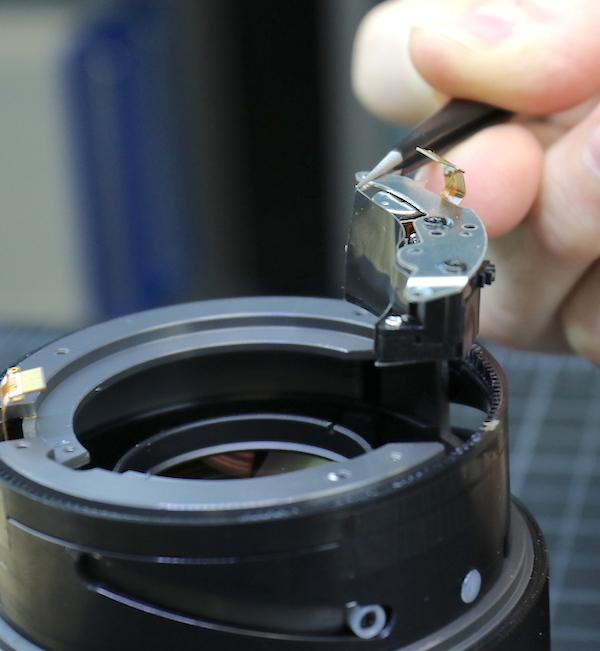 After that we can slide the filter ring off, exposing all of the inner lenses. We removed one of the focusing element bearings (you can see it in the image above at the bottom right). It’s a nice sized piece of nylon held in place with a reasonably robust screw. Again, not over engineered, but certainly reasonable for the task. You may also have noticed another surprise in the image above. The front group also has eccentric adjustment collars, locked in position with more black glue. There are a couple of screws holding the two halves of the inner lens barrel together here, so, of course, we took them out. And took the inner core apart. The front part contains most of the lens’ optics. 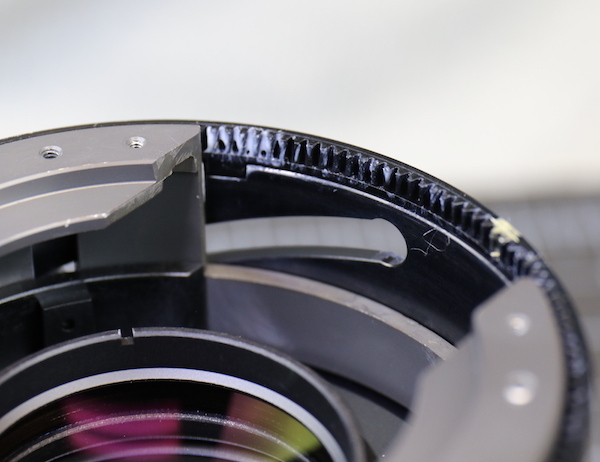 The other portion contains the aperture assembly, which you can see below, and focusing element. 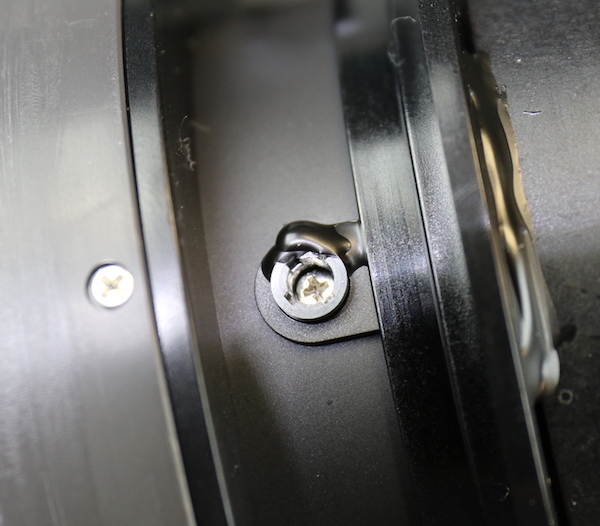 There were a couple of sheathed screw pins that seemed to hold the aperture assembly in place. 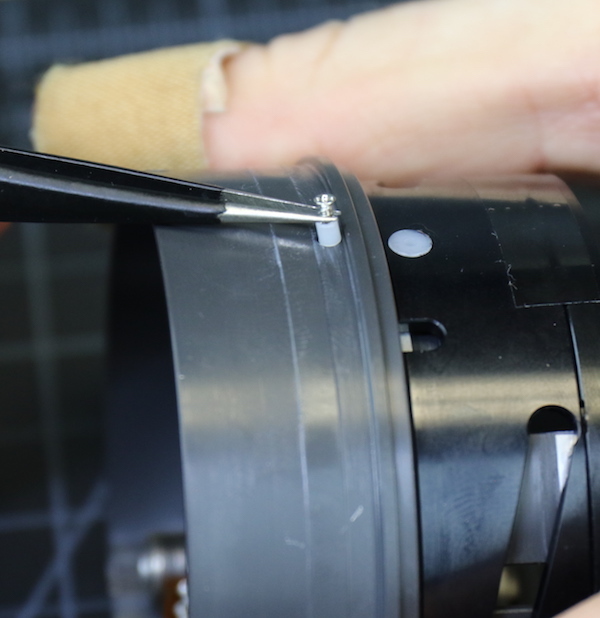 With that done we can remove the aperture assembly and separate it from the focusing element. The aperture is a nice, smooth, 9-bladed affair. 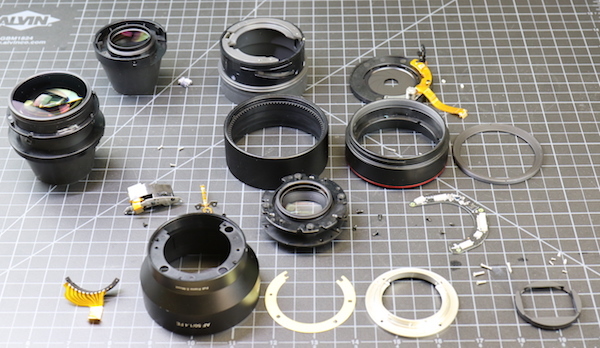 And now we can set all the pieces out on the table where you can see how complex a very simple 50mm lens is. This lens was a pleasant surprise. No, it’s not built like a tank. But it is built like a small, efficient, well-constructed lens. 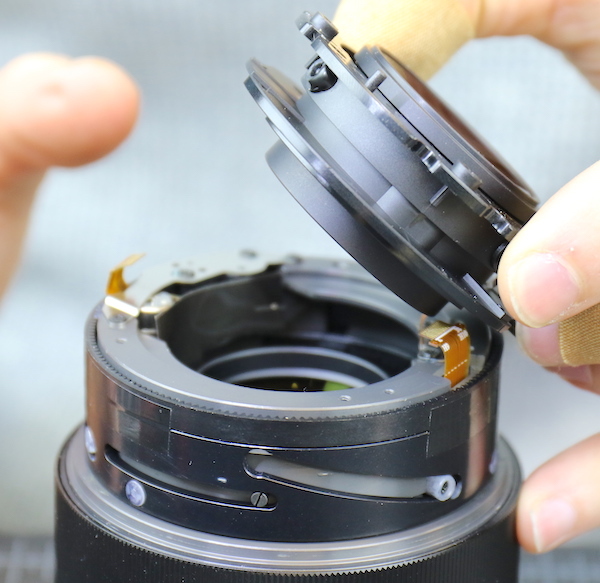 With some of the previous Samyang / Rokinon lenses we disassemble them going “Oh, that’s going to break. 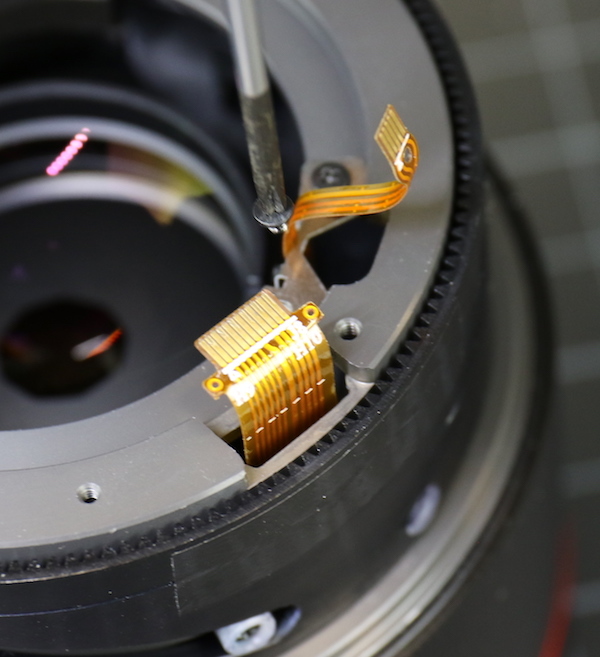 This could be a problem.” We didn’t see any obvious weak points like that with this lens. It’s a clear step up in construction quality. It should be, it’s also a step up in price point. 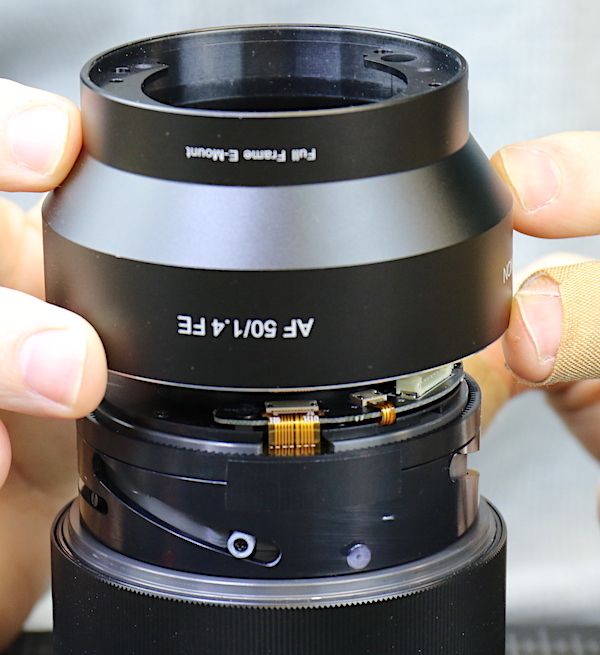 We also were very, very pleasantly surprised by the adjustable elements in this lens. 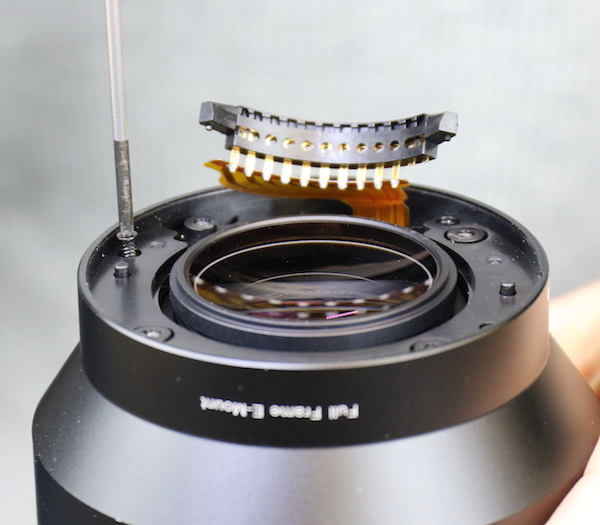 For those of you who don’t know, many inexpensive lenses (and some quite expensive ones) are often simple stacks of ‘element – spacer – element – spacer.’ There’s no optical adjustment that can be done. What you get is what you get, and what you get is often decentered. So another pleasant surprise. In fact, we were impressed enough that we ran a set of the Rokinon 50mm f/1.4 AF lenses through testing on the optical bench. We only had eight copies available, not the ten we usually run, but still, that should give us a reasonable idea of what the lens should be like. Several reviewers have reported that it’s decent, but not amazing wide-open, and then sharpens up considerably at f/2.0. Here are a couple of comparisons, just to give you some MTF examples. First, we’ll look at it compared to the Sony 55mm f/1.8. Please take into consideration that the Sony is being tested at f/1.8. The Rokinon would have a bit higher MTF at f/1.8. Probably a more reasonable comparison is to the Canon 50mm f/1.4 lens. The Canon is not an FE mount lens, of course, but it’s a decent, low-price autofocus 50mm lens. It gives Canon shooters an option for a wide-aperture prime at low cost, just like the Rokinon does for Sony Fe shooters. The Rokinon holds up in this comparison very well. 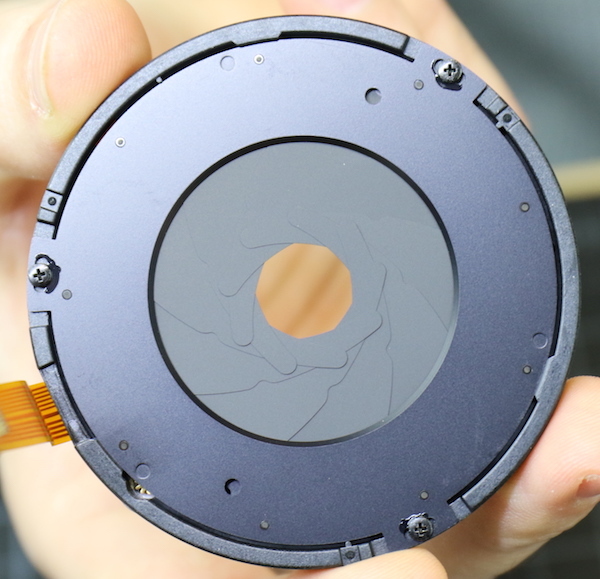 There’s obviously a lot more to deciding if you want a lens than how it looks on a teardown and what it’s MTF charts look like. But based on just those two things, I think it’s worth considering. It’s always nice to have choices. What an excellent service Roger Cicala and his colleagues have provided to us. I’ve read several of these tear-down articles and have found each of them to be informative. We certainly get the sense that the work done by Mr. C is helping manufacturers such as Sony and Rokinon (to name but two of the firms whose wares I have read about). For this alone, they are to be congratulated. Thank LR crew. It would be nice to see the MTF of both at f/1.8. Agree +10. I am thrilled to see anything about Rokinon/Samyang that puts competitive pricing and q/c pressure on Sony. If Samyang can improve from the category of “crap shot consistency” to average or better, why can’t Sony? Complaining and being unappreciative would seem to fall in the category of “no good deed will go unpunished”. I did have the same question about f/1.8, but my expectations would not be that the Samyang f/1.4 could equal the IQ of a good copy of the FE55 f/1.8 with its near mini-Otus IQ. For me, AF is essential for this kind of lens, so the Otus is of zero interest even if budget justifiable. I reluctantly got an semi-affordable gray-market FE55 to maximize IQ of my a7Rii. And the AF of the FE55 is not just good enough, but world-class. But still over-priced for this retired volunteer hobby’ist. This Canon f.f. semi-defector aches for the [year | decade] when Sony will offer a lens line-up and world-class q/c such as Canon can do with their affordable fast primes. That would be a something of a series to fill-out their affordable FE28 f/2 which was purchased along with the a7rii. Canon has non-“L” fast primes at 20mm, 24mm, 28mm, 35mm (own), 50mm (own), 85mm, 100mm. And the extraordinarily affordable pancake 40mm f/2.8 with great q/c and high IQ. There is value in having a native lens. I actually use my FE28 more than my FE55 purchased later … like stitched panos in portrait mode to provide at least Medium Format IQ. I’m hoping Samyang releases a similar type lens in the portrait length of 100mm to 135mm f/2 with at least decent q/c and adjustable optics tuned at the factory, ideally with eye focus detection. (85mm is too close to 55mm to be of any interest to me). so interesting to see the steps. A quick note: “it’s” is not the same spelling as “its”, and they do not have the same meaning either. Young smartass adds nothing to the conversation. More on our 6:00 PM newscast…..
Coming up tonight at 10:00 – the dinner foods that could be killing your family. I believe I have admonished you before about this, but you are once again 100 percent completely and utterly wrong with regard to your role in the success of LensRentals. You are not merely taking apart lenses and writing little articles. You are engaged in very high level type of marketing and your time card should reflect that. I estimate LensRentals would have to pay a big New York marketing firm a retainer of at least $20,000 a month to do what you do as part of your normal job. So, no more of this talk about “because I enjoy it and think it’s useful.” These posts are why the company is where it is today. If you were to stop posting, retire, or God forbid die, what reason would there be for anyone to choose LensRentals over BorrowLenses or any of the other companies? Nice to know this is a solid offering. I do hope they come out with some smaller + lighter offerings though. I would love a sharp plastic 40/2 AF pancake. I have a manual focus Spiratone 400mm f6.3 T-mount lens. Can y’all fix that? I should thank Roger for taking the time to provide the information that he does. 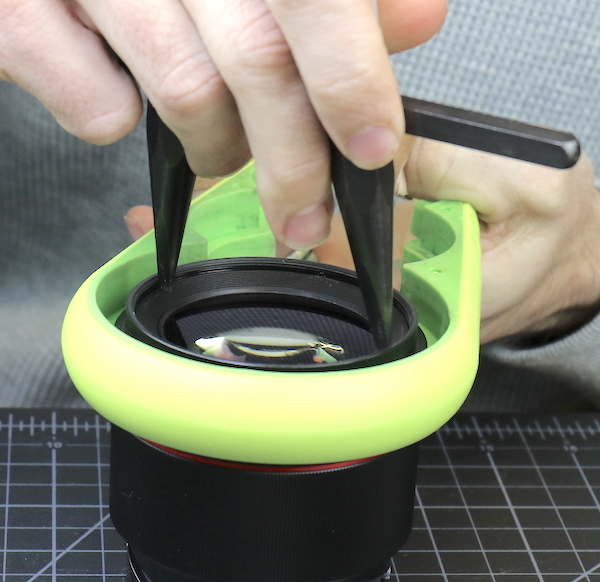 There is a physical connection: turning the ring mechanically focuses the lens. Harvey, our purpose here is not to test lenses for the blog articles. We’re testing them to be able to determine which lenses are OK, and which are not optically for Olaf Optical Testing. That requires wide-open testing because wide-open is where we will see the most problems, defects, and variation. Because I enjoy it and think it is useful, I put our results up on the blog for people to look at. I don’t have the time or finances to retest everything at other apertures even though I know people would like to see it. There’s a reason there aren’t a half-dozen other sites publishing optical bench data: it’s just too expensive to do as a lens review kind of thing. Right now we’re just sharing what we’re doing for other reasons. We probably won’t be able to even keep doing that a lot longer. There is a system in place to do a set of 10 at full aperture for a variance measurement, or take the most average of them and test it at each stop between its full aperture and f/16. Testing only at f/1.8, or f/2, or whatever, will create problems down the road. What is the value of an apples to oranges comparison, though? Comparing the Rokinon with the native lens at the same aperture would be considerably more meaningful than comparing it against a lens that requires an adapter. This site happened to write a great article on the downsides of adapters, so they surely understand better than anyone the value of comparing lenses that are native to the same mount. Just make it an apples to apples comparison. Otherwise, the comparison is not a fair comparison. Since the time afforded to LR to do these measurements is limited, and wide open performance is often the most critical, it makes sense to run all tests wide open. With the current comparisons, it’s obvious that it isn’t as sharp as the 55mm f/1.8 wide open, but is better than the EF 50mm f/1.4. Stopped down, it’ll probably get much better. Did I say every aperture? I only cited one (not two, three, or every, as you say) aperture. 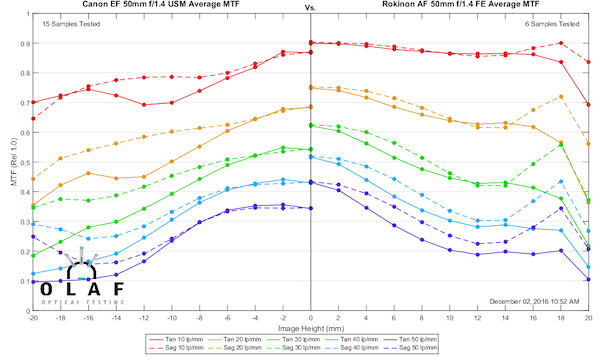 because MTF data = time + money and given that this is a Rokinon lens, there probably aren’t enough in house at any given time to take them for hours and measure the MTF at every aperture. 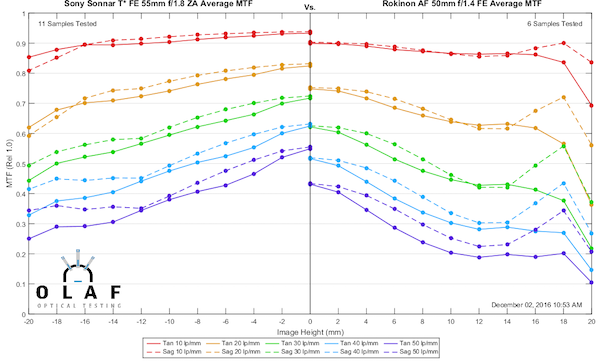 Why not compare the MTF of the Rokinon at f/1.8 with the Sony at f/1.8? Wouldn’t that be more of an apples to apples comparison? I think they were capable of doing this themselves, but I have no clue if they did or not. I thought the price difference made it unreasonable. But, of course, the Sony 50mm kills it. 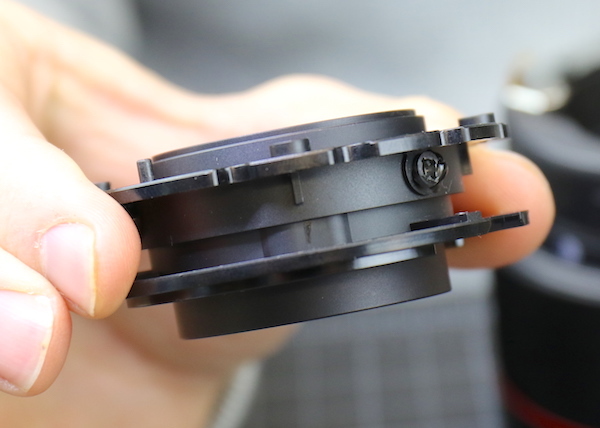 Looking at the focusing ring, does it have any physical connection to the actual moving lens elements? Does the sensor just record your movement and then tells the drive to rotate equivalently? 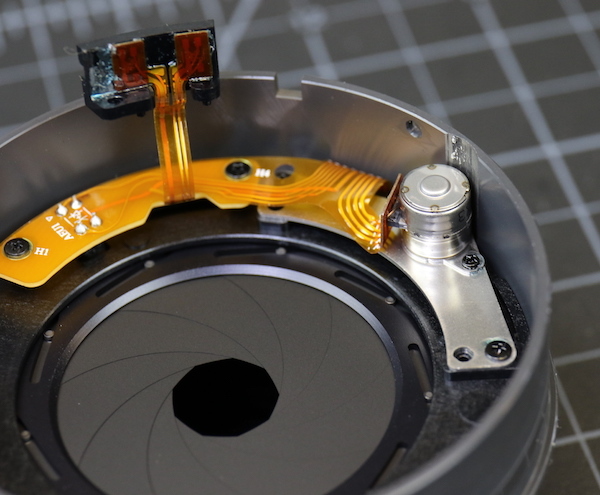 And very nice blog post aswell, makes me want to tear my old MF-lenses apart out of curiosity. Interesting stuff. 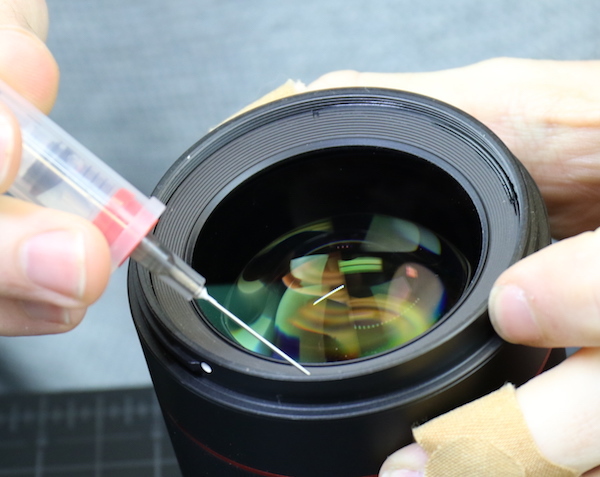 Being as familiar as you are with the internals of the other Samyang lenses, would you say that this has enough signature touches to clearly flag it as one of theirs, or are there signs that it’s been done by an entirely different – or even external – team to their others? Thanks for the work. It’s nice to learn that Samyang has upped their game. And just a little suggestion: perhaps it’s better to compare it with Sony’s own FE 50 1.4 ZA, rather than the 55 1.8. I think maybe another typo? 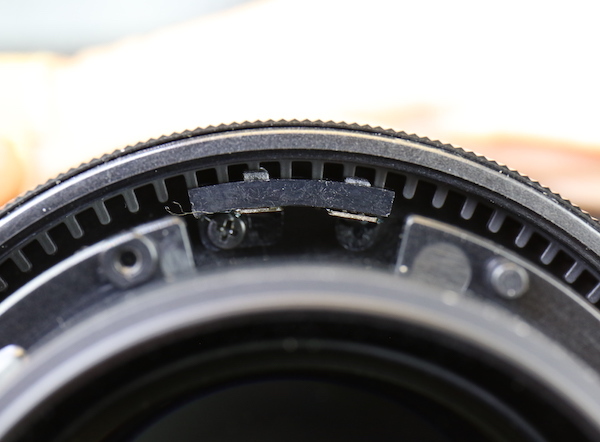 The lens has eccentric collars instead of just being stacked with shims. “So this is a problem and bodes well for lower copy-to-copy variation.” So this “addresses that” problem and bodes well? “Collars” in: eccentric adjustment colors. Interesting. I knew Sam/Roki/Bow were a bit dodgy regarding sample variation but not about maintenance issues. Coincidentally I sold off my Samyang 8mm and 14mm lenses last month after getting the autofocusing Canon 8-15mm fisheye. They were really not adding any value to my camera bag anymore. Didn’t know I was potentially dodging a maintenance bullet in the process.